Last week was only 3 1/2 days of trading but with lots of selling. The S&P 500 index ETF (SPY) is testing weak support established by range lows from the sell off early this year. 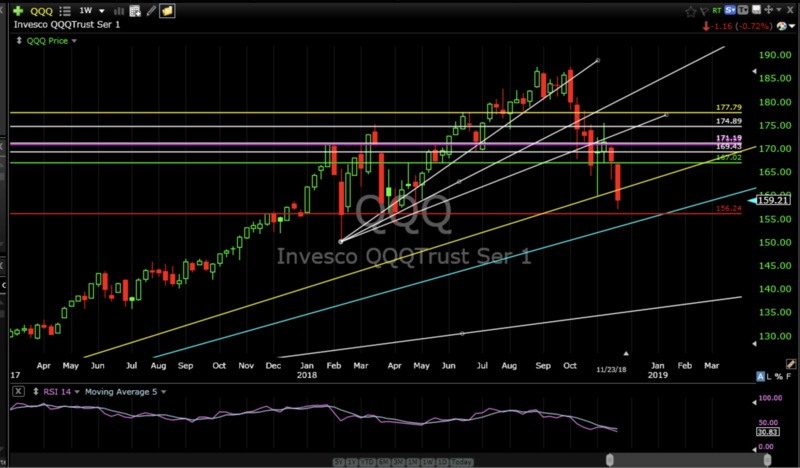 The Nasdaq ETF (QQQ) is in the process of testing those same lows but looks like it needs to work it’s way down a little further. 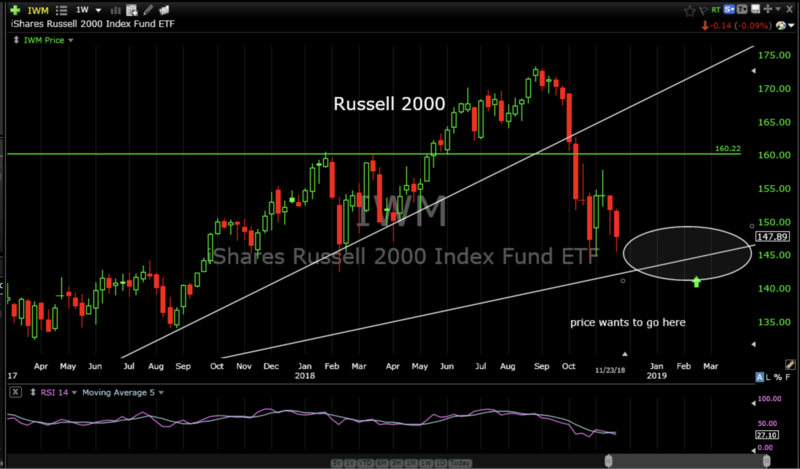 The Russell 2000 Index ETF (IWM) also looks like it wants to work it’s way down a little lower into support. 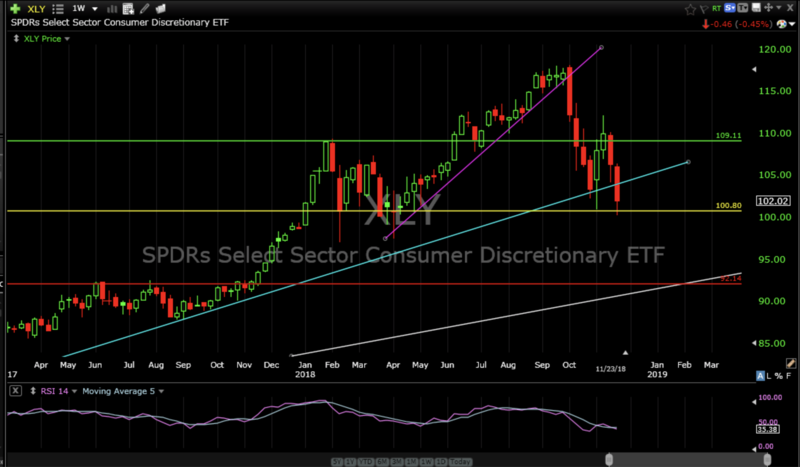 Although last week was a short one and there isn’t a lot to glean from limited activity I do not like how the Technology Sector ETF (XLK) or the Consumer Discretionary Sector ETF (XLY) closed the week, especially since they have been leading sectors over many years. They both closed below rising support levels established from the lows in 2016. XLK traded down into the closing low from early February which happens to be the closing low of 2018…so far. From there it got a little bounce to close below intermediate rising support, which has been my original target from a month ago. While it has a chance to bounce from current support the big negative is that it has closed the week below intermediate rising support. If it had closed above this rising level it would be viewed as a positive. If worms carried machine guns birds wouldn’t mess with them. So close yet so far. Cue melancholy violin strumming. XLY also closed below intermediate rising support established off the lows from 2016 and is testing the closing lows from earlier this year. 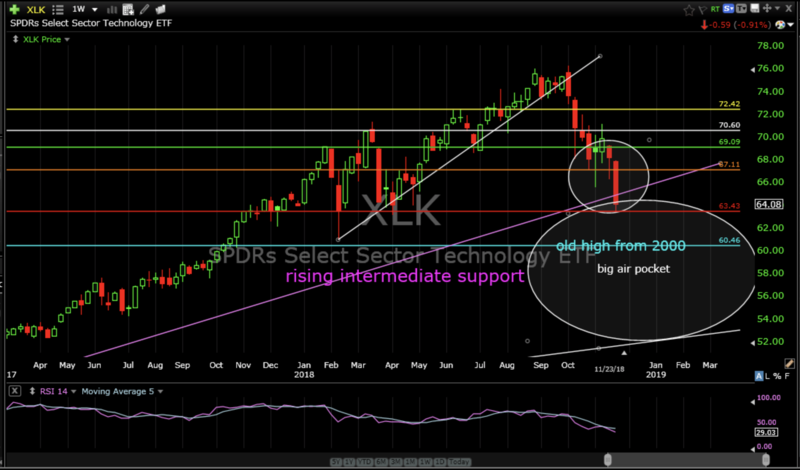 Just like XLK, XLY has a chance to bounce from current support but the big negative is also that it has closed the week below intermediate rising support. While XLK and XLY certainly can bounce from their current levels the fact remains they both closed below rising intermediate support. This means something is wrong. 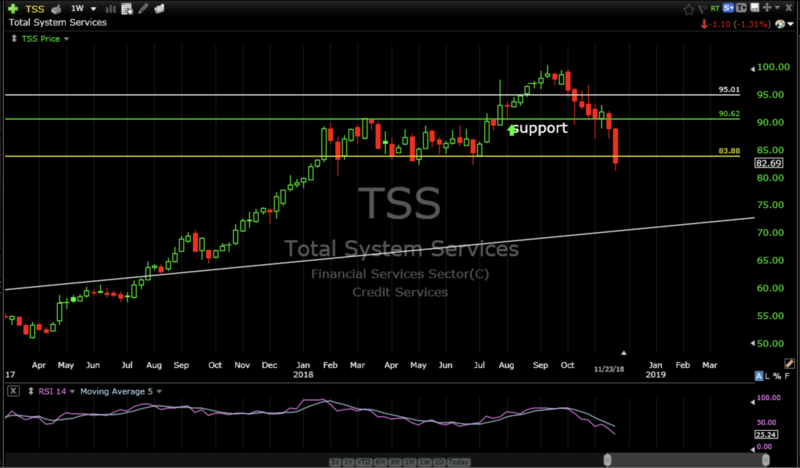 In addition, if current support levels don’t hold expect momentum to continue to the downside. The negatives appear to outweigh the positives and unless we get some solid bottoming action soon we are likely going lower. 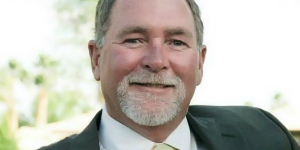 Markets need to bottom at levels that are strong enough to support price and sustain higher price levels based upon historical evidence. 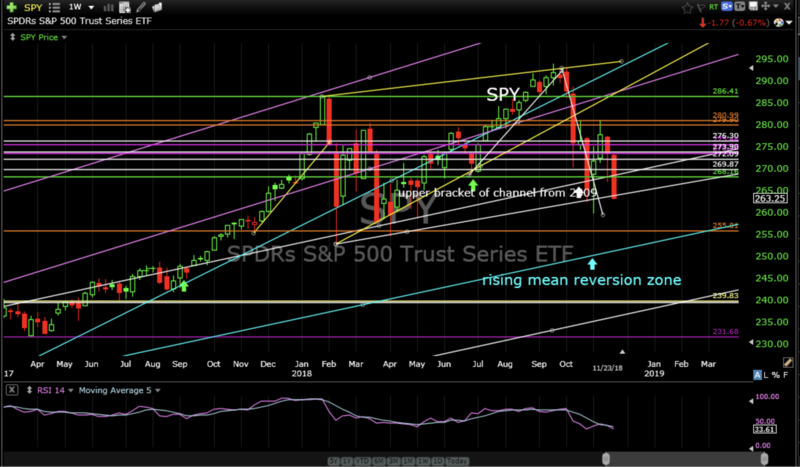 Breaking multi year rising support does not mix well with historical evidence to sustain higher price levels. I’m getting tired of saying “let’s hope I’m wrong” but let’s hope I’m wrong. I continue to recommend selling. I recommend selling it and limiting losses to about 10%. 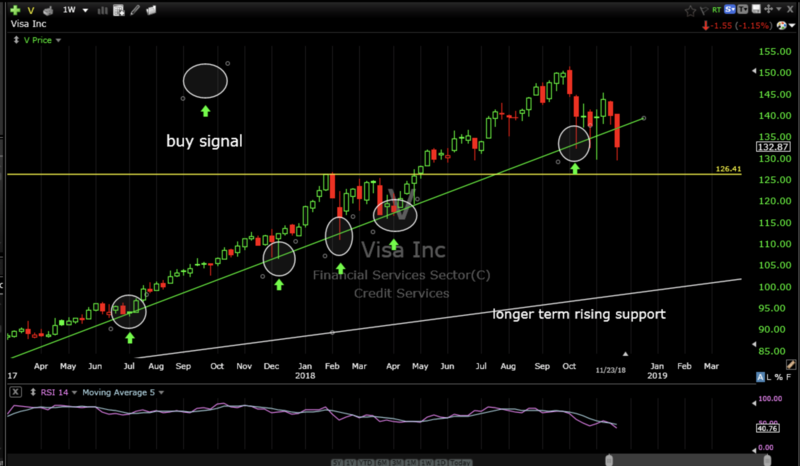 This market is so bad that even V broke rising support. That’s bad. Sell it and limit losses to about 5%. In conclusion, I plan to spend the week researching interest bearing mattresses.